When we breathe, air enters our lungs and fills tiny airsacs called alveoli. Each air sac is surrounded by an extensive capillary bed, which is a network of tiny, thin blood vessels. Capillaries are the smallest blood vessels in the body. 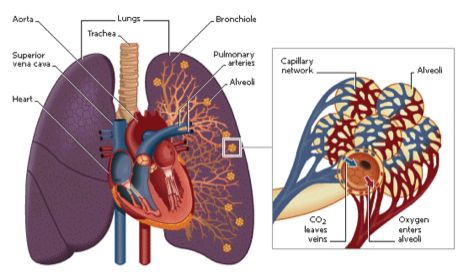 In order for us to bring in oxygen and release carbon dioxide, the alveoli and capillaries must be properly aligned. If there are not enough capillaries or the capillaries are too far away from the surface of the alveoli, gas exchange cannot occur effectively, which means there is not enough oxygen for the body and the heart must work much harder. Alveolar Capillary Dysplasia with misalignment of the pulmonary veins (ACDMPV) is a rare disorder where the microscopic capillaries around the air sacs fail to develop normally. There are fewer capillaries, and the ones that are present are not positioned correctly within the walls of the alveoli. This makes gas exchange (the delivery of oxygen from the lungs to the bloodstream) very difficult and ineffective. Normally, the blood is brought to the capillaries by arteries, and the veins carry blood away from the alveoli to the heart in bundles with lymph vessels. In ACDMPV patients, these veins are found abnormally bundled with the arteries and the smooth muscle tissue in the arteries is often thickened, which restricts normal blood flow. When this occurs, it increases the blood pressure in the pulmonary arteries and makes the heart work harder. This causes pulmonary hypertension and is one of the main symptoms of this disease. Alveolar Capillary Dysplasia is a developmental anomaly of the pulmonary vasculature: it is generally described as the failure of formation of the normal air-blood diffusion barrier in the newborn lung. Alveolar Capillary Dysplasia results in an infant fatality in almost every occurrence and is usually associated with “misalignment” of the pulmonary veins. Neurologic disorders, including perinatal asphyxia and congenital neuromuscular disorders. ACDMPV is a pulmonary disease that presents in very early infancy. Infants generally become critically ill in the first days of life with severe hypoxemia and pulmonary hypertension, although limited reports have begun to emerge of presentation beyond the neonatal period in patients with atypical or late presenting ACDMPV. The majority of patients with ACDMPV (up to 80%) will have other associated anomalies of the cardiovascular, gastroinstestinal, urogenital, or musculoskeletal systems. The initial presentation is identical to severe idiopathic pulmonary hypertension of the newborn. However, infants with ACDMPV do not respond, or respond only transiently to therapies that are usually effective in reversing this condition. Infants with ACDMPV do not improve despite maximal support in the intensive care nursery including mechanical ventilation, nitric oxide, and extracorporeal membrane oxygenation (ECMO). The ACDA has grown to over 200 families from around the world. Worldwide, there are only a few hundred cases of ACDMPV reported formally in the medical literature since first identified in 1948. The incidence or prevalence of ACDMPV is not yet known but there are almost certainly more cases than those officially reported. For several reasons, these case reports almost certainly underestimate the true prevalence of ACDMPV. First, the definitive diagnosis of ACDMPV currently depends on histological examination of lung tissue on autopsy or ante mortem lung biopsy, and neither of these diagnostic modalities is universally pursued in the setting of a critically ill or dying newborn. Second, many infants born with ACDMPV have associated malformations in other organ systems that may allow the lung pathology to go undetected. Third, the diagnosis may be missed by pathologists unfamiliar with the disorder. It seems likely that some cases originally classified as idiopathic persistent pulmonary hypertension of the newborn (PPHN) may actually have been ACDMPV. Last, evidence is mounting to suggest that a less severe phenotype compatible with prolonged survival might exist, although definitive diagnostic criteria for this group are yet to be established. No geographic pattern is apparent; cases have been distributed worldwide. More than 90% of affected infants are born at term, and in greater than 60% of cases, onset of cyanosis and respiratory failure occurs within 48 hours of birth. Most of the cases have been sporadic, de novo events, but approximately 10% involved siblings, suggesting a heritable form of the disease. For additional information, please refer to the information on ACDMPV genetics HERE. The diagnosis of ACDMPV should be considered in infants who present with severe hypoxemia and idiopathic pulmonary hypertension, and who do not respond appropriately after 7 to 10 days of neonatal intensive care treatment as described below. The majority of patients with ACDMPV (up to 80%) will have other associated anomalies of the cardiovascular, gastrointestinal, urogenital, or musculoskeletal systems. The initial chest radiograph is usually normal. If a cardiac catheterization is performed, there may be absence of the capillary blush phase. The diagnosis can only be confirmed by lung biopsy or autopsy. Consulting a pathologist with experience in making this diagnosis may be helpful. Pathological features include a paucity of alveolar capillaries, widened alveolar septae, and increased muscularization of pulmonary arterioles. There is usually malpositioning (“misalignment”) of pulmonary veins in the bronchovascular bundle, but this is not required for the diagnosis. A focal distribution of disease has been described, which makes it necessary to examine multiple lung sections if ACDMPV is suspected. Standard therapies include mechanical ventilation, high concentrations of inspired oxygen, inhalational nitric oxide and ECMO support. These therapies prolong life by days to weeks, but have not led to long-term survival. Because none of the supportive therapies described above has changed the expected mortality due to ACDMPV, lung transplantation is currently the only option that might prolong survival. Achieving early diagnosis by lung biopsy is an essential first step, followed by strategies that sufficiently prolong survival. Lung transplantation may provide effective treatment for carefully selected affected infants. Donor availability continues to limit the utilization of lung transplantation for neonatal diseases. Several patients have survived with atypical or late presenting ACDMPV long enough to receive lung transplants. For additional information about lung transplants, please click here. Reports of infants presenting with clinical features of ACDMPV beyond the neonatal period have begun to emerge. With such limited information, it is difficult to estimate the number of patients with delayed presentation of ACDMPV. Until more specific diagnostic tools become available, similarities in lung pathology and clinical findings should increase diagnosis using the same approach to lung tissue sampling in late presenters as for those who present early. Bishop NB, Stankiewicz P, Steinhorn RH. Alveolar Capillary Dysplasia. American Journal of Respiratory and Critical Care Medicine. 2011;184(2):172-179. doi:10.1164/rccm.201010-1697CI. Steinhorn RH. Alveolar Capillary Dysplasia. In: NORD Guide to Rare Disorders. Lippincott Williams & Wilkins. Philadelphia, PA. 2003:672. White F, Sweet S, Grady RM, Faro A, Michelson P, Eghtesady P, Boston U, et al. Case Series Of Infants With Atypical Presentations Of Alveolar Capillary Dysplasia With Misalignment Of The Pulmonary Veins Who Underwent Bilateral Lung Transplantation. American Journal of Respiratory and Critical Care Medicine. 2013;187: A2251.